Mason St City Farm will employ 2 staff and one paid Nursery Apprentice in 2018. We are now accepting applications for our Nursery Apprentice Position, see details below. This apprenticeship is well suited for individuals with a strong work ethic who are seeking a career path in ecological food production. The apprentice will work closely with the Nursery Manager and volunteers to sow & grow a wide variety of annual vegetable starts, set up and maintain a sales area, and other related duties. Most days of this apprenticeship will be fun and enjoyable. Some days may be challenging, wet and monotonous. 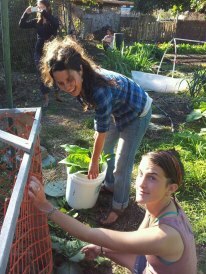 You will gain a wide range of experience cultivating and caring for young annual vegetables. And, we will be serving coffee! Apprentices work 1 full day per week with a stipend of $80 per day (7 hrs). The position will last 9 weeks, tentatively beginning the week of March 12th and ending the week of May 9th. Exact schedule to be determined, please indicate which days of the week you are available in your application. Apprentices are responsible for providing their own room and board in Victoria. Work will be outdoors at the Mason St. Farm site at 1015 Balmoral Rd., Victoria BC. You will work in all areas of our community nursery business including propagation, plant maintenance, sales, troubleshooting, pest & disease prevention & control as needed, transplanting , volunteer management, marketing, administrative work and record-keeping.